Days after Russia blamed Israel for downing of plane over Syria, Russia vows to upgrade Syrian air defense network. Russia vowed Monday to upgrade Syria’s anti-air defense network, following the downing of a Russian military aircraft in Syrian airspace last week. 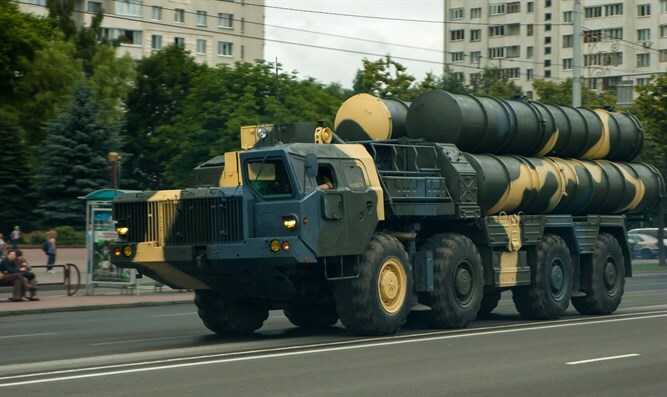 The Russian Defense Ministry announced plans to arm the Syrian military with advanced S-300 surface-to-air missiles – replacing its defense network of older S-200 missiles. The Russian military will also work to actively jam the radar systems of approaching warplanes near the Syrian border. Russian President Vladimir Putin informed Israeli Prime Minister Binyamin Netanyahu of the plan during a phone call between the two leaders Monday, claiming that the move was needed to protect Russian soldiers deployed in Syria. Netanyahu protested the decision, saying the transfer of the missiles to “irresponsible hands” was “dangerous”. “The Prime Minister said that the transfer of advanced weapons systems to irresponsible hands would make the region more dangerous, and that Israel would continue to defend its interests and security,” the Prime Minister’s Office said Monday evening. In recent years, Russia has refused to sell the advanced surface-to-air missile system to Syria. Shoygu said the missiles would be transferred to Syria in two weeks. Last Tuesday morning, an IL-20 reconnaissance aircraft was reported missing over Syria, following an Israeli airstrike on a military research facility in northern Syria.